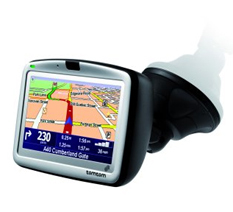 TomTom Go 910 is an GPS traffic navigation system for automotive and car or simply portable GPS car navigation system. TomTom Go 910 features 4-inch widescreen touch-sensitive display, Bluetooth connectivity to connect to Bluetooth-enabled device such as mobile phone and thus doubling as a handsfree speakerphone. Beside, it’s also a MP3 Player where TomTom Jukebox plays MP3s from the 20GB hard drive and has full iPod compatibility to connect to iPoh via iPod connector cable and has the ability to control the iPod unit through the touchscreen. Other than Laptop Magazine, others have also reviews and tests the TomTom Go 910 GPS automobile navigation system. Lordpercy (dead link) reviews TomTom Go 910 and concludes that priced at 500 pounds you are paying for all these extras and the European / USA maps plus all the extras, but the TomTom Go 910 is a complete package which seems to contain everything we liked about the Go range and now the few extras we liked from other systems. Text to speech is a welcome addition as is the new larger screen, MP3 playback and the hands free kit we could live without but some of the new Plus service look like the innovation that personal SatNav is going to demand in the coming year. Sure the Go 910 is priced at a premium, but you are an early adopter aren’t you? CNet also reviews the GPS navigation system and gives the GO 910 GPS navigator editor’s rating of 7.7 out of 10 and concludes that for early adopters, the TomTom GO 910 is the GPS gadget du jour, offering the latest and greatest in portable navigation systems. That said, we wish it had a better mounting system and a more up-to-date POI database. MyTomTomGo (dead link) writes that “I like the new TomTom GO 910. Really, I do. The excellent wide-screen, the text-to-speech capability and of course the SiRF Star III-chipset are all a big step forward compared to the GO 700. Also the audio-possibilities and the improved hands free function are very big plusses. However, there is still that very big minus also, and that is the new mount. I really can’t say that I have a lot of confidence in the new mechanism, and I wouldn’t at all be surprised if it ended up causing problems for a lot of users. GPS Magazine (dead link) selects TomTom GO 910 as GPS editor’s choice and says that TomTom’s 910 is an excellent GPS unit that performs better than any of its current competitors. It’s all the more frustrating, therefore, that TomTom shoots itself in the foot with the details like inadequate support, poor mounting hardware, and buggy firmware releases. Even with its current issues, we’re still giving the 910 the Editor’s Choice award. If you’re looking for an excellent, easy to use, GPS unit for your, you’d be hard pressed to do better than the TomTom GO 910.